Having a small crowd and not a small army for a meal? 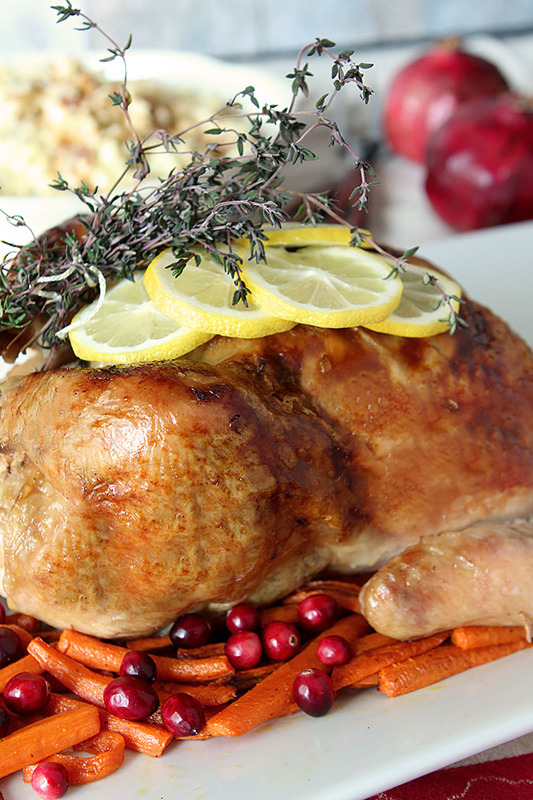 Try this Lemon, Roasted Garlic, and Thyme Roasted Chicken. All the flavors of a Thanksgiving turkey but so much easier to make and perfect all year round! I know some might consider this suggestion sacrilegious but honestly, bear with me. Have you ever had a year or even more when the need for a monster turkey was overkill? When no relatives were coming and you and your small family decided to just veg for the day? My girls and I would have those days; we never lived near relatives and some years, we just decided to stay home and in our jammies all day while we cooked a Thanksgiving meal. I honestly wish I had thought of doing this sooner. I call this a Mini-Turkey. You know, a chicken. And when done with a bit of extra care? I think it was better! Flavored with lemon zest and juice, roasted garlic and thyme (yes, from my garden and you can see it’s starting to turn it’s winter color), it tasted outstanding but took less than 15 minutes to get ready and less than 2 hours in the oven and that was for a 5 lb bird. Get a smaller one and it’s even quicker. I wanted to make this really simple and it was. I served some roasted carrots on the side with simple smashed potatoes with Boursin Garlic and Fine Herbs cheese (check out my post tomorrow for that recipe). Not a million sides either, and while I missed them a bit, for this meal it was perfect. The flavors of Thanksgiving without either the huge job to get it done or the huge job to cleanup…it was sort of nice. Not that I don’t enjoy the big family effort and big family meal but no more when there is no big family to eat it all up! Still undecided and struggling with the overwhelming nature of a 20 lb bird for 2-4 people? Here you go…keep it simple AND delicious! Position rack in lower third of oven; preheat to 400°F. (I have a toaster oven; it's perfect if you have one). Rub off excess papery skin from garlic heads without separating the cloves. Slice the ends off the side opposite the root, exposing the cloves. Place the head on a square of foil, drizzle with the olive oil and wrap into a package. Roast until very soft, 40 to 45 minutes. Unwrap the foil and let cool. Zest and juice the lemon; putting both into a bowl; reserving the lemon peels. Add the melted butter, olive oil, chopped thyme, pepper, and salt to the lemon mixture. Squeeze the garlic cloves out of their skins into the bowl. Mash with a fork and then whisk together until the mixture forms a paste. Remove the turkey from packaging and remove any giblets from cavity and use for gravy or discard. Pat the chicken dry with paper towels and loosen the skin over the breast and thigh meat. Rub the lemon garlic paste under the skin onto the breast meat and leg meat, a little inside the cavity and all over the outside of the bird. Tuck the wing tips under the chicken. Place the reserved squeezed lemon skins, thyme sprigs and 2 onion quarters in the cavity. Tie the legs together with kitchen string. Place the chicken breast-side up on a roasting rack set in a large roasting pan. Pour the chicken stock into the bottom of the pan (add additional water to the pan during roasting if necessary). Roast the chicken for 1 and 1/2 hours, basting every 15 minutes with the stock/drippings in the bottom of the pan. 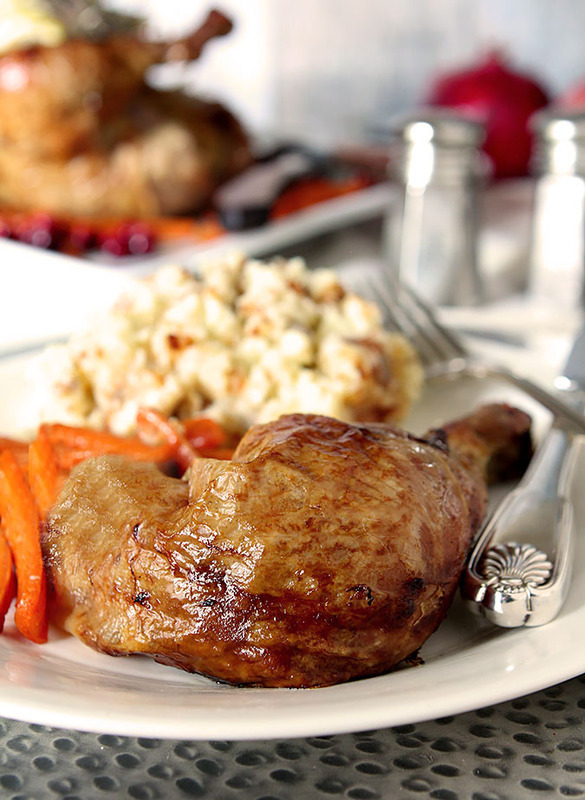 Chicken is done when the juices run clear when you cut between a leg and thigh or until an instant-read thermometer inserted into the thickest part of a thigh without touching bone registers 165°F. Remove the chicken to a platter and cover with aluminum foil for about 20 minutes. Remove foil and garnish with thyme and lemon slices if using. Serve. If necessary tent the bird with foil to stop browning before roasting is done.